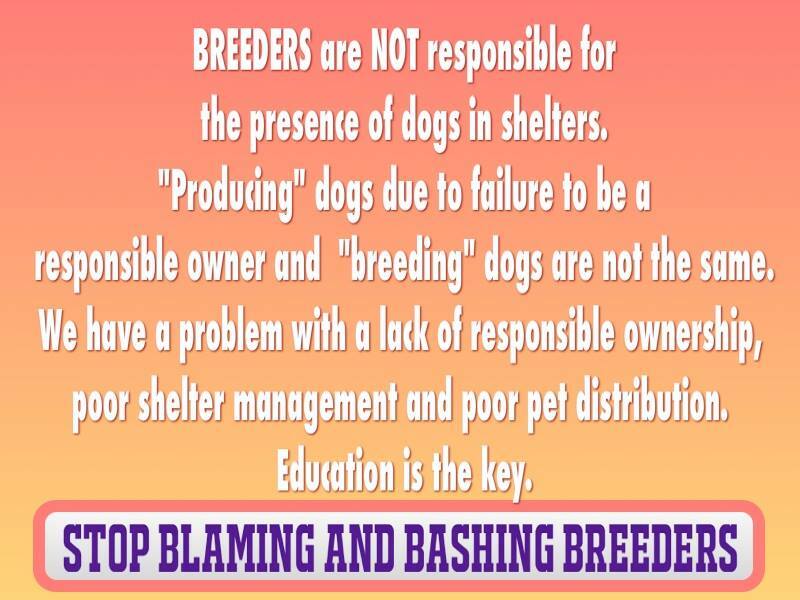 I am a responsible breeder of purebred dogs, if you are also a responsible breeder please understand the importance of educating the public to our cause. 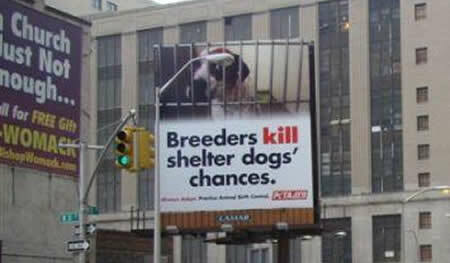 I am not anti shelter or anti rescue – I love what responsible organizations accomplish. I am not anti mixed-breed, they happen, but I cannot and will not support the creation of designer mixed breeds. I am a responsible breeder of purebred dogs and I want our purebreds to continue to be an option for those who seek a dog as their pet. 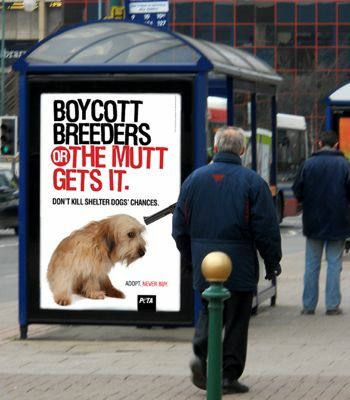 If you are a responsible breeder I hope you champion our cause by taking a stance and educating others with information that supports our cause. 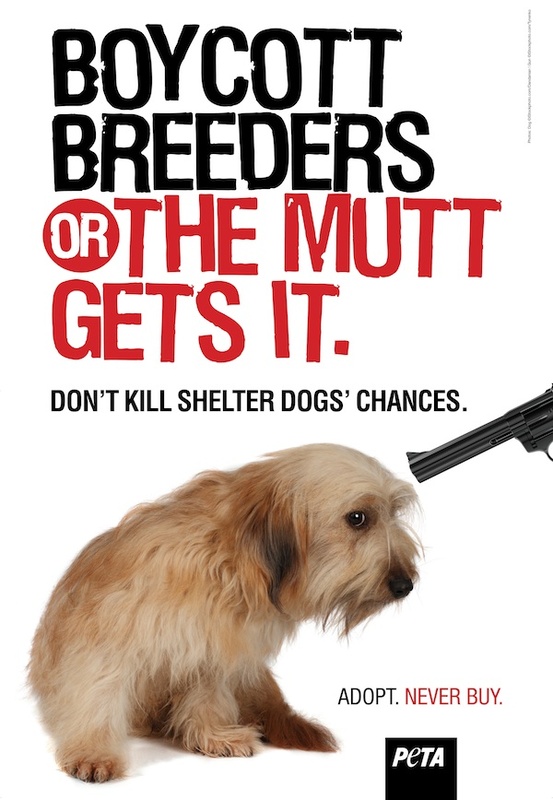 Breeders need to take action. I am a responsible breeder of purebred dogs and for over 40 years I have belonged to many dog clubs such as, All Breed kennel clubs, my Parent (National) Breed Club, my regional Specialty clubs and my local Sporting Breed club. I belong to these clubs because I support and believe in purebred dogs. I believe that purebred dogs make wonderful, predictable pets and I want to contribute, where ever I can, to furthering their propagation in the healthy, responsible manner that a respectable breeder exhibits. I belong to these clubs as that is what we do, clubs provide a source of education through mentors and educational programs and those activities propagate the purebred dog. Our (club’s) purpose is not simply to host dog shows, obedience trials, hunt tests, field trials and the like, our purpose is to also educate about and promote purebred dogs. As I watch the number of registered purebred dogs decline while the membership of purebred dog clubs follows suit, I recognize that in addition to addressing this issue as individuals, so must we also band together as groups to address and send a more unified and potent message. If you are not a member of your Parent club, a local all breed club or a similar organization, and you want to continue your right to be a breeder, it’s time to join forces with others like yourself and become a working, contributing member. If you are already a member of a club I believe it’s time to recognize the need to go back to the educational basics of your organization, it’s time for our clubs to step up to the plate to publicly address head on, the issue around the bad rap that’s being handed out to the general public about breeders and their purebred dogs. Our club’s role should include educating the public through publicity to tell the story of purebred dogs and their breeders. Does your club have any plans in place to work on this? Has it ever been an agenda item for one of your meetings? Have the Officers & Board of your club ever held discussion around the topic? Have you brought this to the attention of your leaders, or are we all, leaders and members alike, simply sitting back waiting for someone else to heed the call to action, or worse yet simply hoping it will go away if we keep our head in the sand long enough? I for one believe we need to send a potent message. 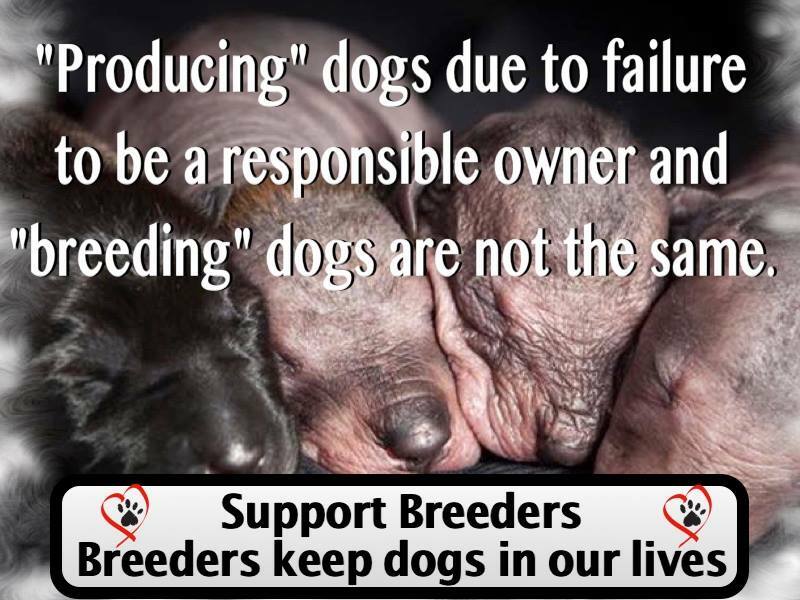 I am a responsible breeder of purebred dogs and I would like other breeders like me, and more importantly our clubs, to recognize the need to create and distribute our own “billboards” to promote what we do and who we are. Start with what we can do for free and move on to what our club budget allows, whether we use websites, Facebook, Twitter or newspaper ads and roadside billboards our message needs to be heard and through many, many more voices and media channels. 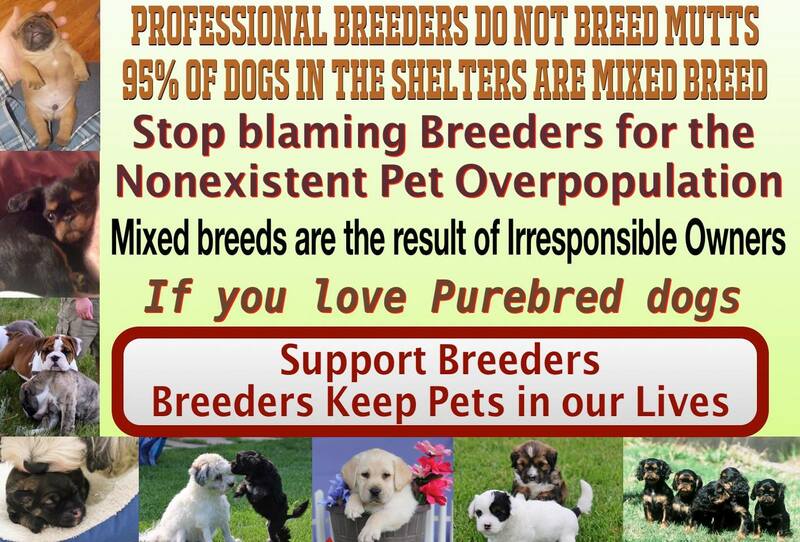 I am a responsible breeder of purebred dogs and I hate what they are saying about us. I will do my part to send a counter message. I hope that every other responsible breeder will join the campaign to promote purebred dogs, that every breeder will join forces with their fellow breeders through membership in organizations and clubs. I hope every one of you will step up and be a part of the collective voice of breeders who know and promote purebred dogs as a rich source of healthy, socialized, and predictable pets who’ve filled our lives with love and joy for centuries. Why do I want a purebred dog? Because I want a puppy whose parents have been carefully selected for health—and who have gone through a series of genetic tests to ensure that the dog I get has the best possible chance of being healthy and well-adjusted. Because when looking for my puppy, I get to work with a breeder, who loves the puppies like they’re her own children and is available to answer all of my questions, give advice, or just happily accept a flood of photos of my puppy growing up. I get a healthy puppy, yes, but I also get a friend for life. I’ll be able to predict my dog’s size, care requirements, temperament, and more from 100-plus years of traceable pedigrees. Also because I have a personal relationship with the breeder, she’ll be able to match an individual puppy’s temperament perfectly to my individual lifestyle. When training my dog, I’ll have the advantage that the process has already been started for me. My puppy has been handled from the start and has already begun to be socialized, which greatly affects how well-adjusted he’ll be as an adult. Furthermore, my puppy will have gotten top-notch expert care from day one. Perfect nutrition, the best medical attention, and ample supervised playtime—all the ingredients for a happy, healthy adult dog. If something should happen to me, my family won’t have to scramble to find a caretaker for my dog because the loving breeder promised in writing to take him back from the start. There’s nothing more exciting than seeing a dog’s natural instincts that have been carefully, expertly bred into him come to life. Watching a pointing breed aiming his muzzle at a bird even though he’s never hunted a day in his life? Watching a Border Collie herd ducks around the yard? Fascinating. And it’s so satisfying to cultivate those instincts into earning medals and titles for my dog in fun sports, like lure coursing, herding, and more. Doing this will also build an unbreakable bond with my dog as we work together as a team. I’ll be taking time to research a breed that fits my lifestyle and personality perfectly. And by doing that, I’ll be practically guaranteeing that the bond with my dog will be like nothing else I’ve ever experienced. I’ll have a partner in crime—a friend who will never judge me and who will share my happiness and my tears for years to come. Who will break my heart when he passes away because he’s been in my life since he was a baby—and even so I know I’d do it all again for him. That’s why I’m buying a purebred dog. I know this is an older article but thanks so much for posting it. As an animal rights activist and vegan, I often wonder if these big mouth fanatics in pet rescue practice fully what they preach about animal ethics and work to protect less furry, less cute animals like cows, chickens, pigs, coyotes, salamanders… They simply don’t get this simple principle- A dog is not a necessary commodity to me; it’s a luxury (and one I spend a lot of money on). If I can’t have the dog I want, I will not get a dog at all. 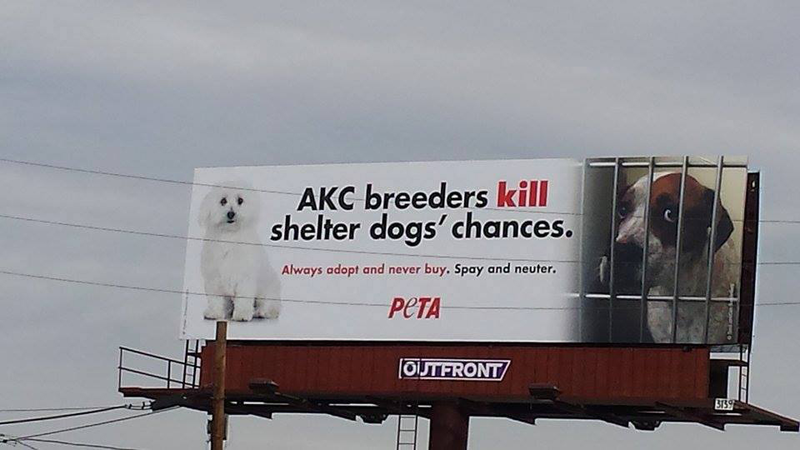 Thanks so all the breeders for putting up with this crap, and thank you God for my American Eskimo. His cheery nature, snowy white fur, fuzzy pink ears, curled tailed and big brown eyes gave me joy every day of the 16 1/2 years I spent with him.